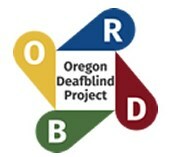 Each month, Lyn Ayer, Director of the Oregon Deafblind Project (ODB), publishes a newsletter filled with interesting articles that help change the way we look at human development and education, with a special focus on students with disabilities. In the past, the TRI Newsletter has featured one article from the ODB Newsletter that jumped out as most fascinating. This month, it was difficult to select just one article, so we thought we'd share the entire newsletter with you. We hope you enjoy this newsletter inside a newsletter. Within These Halls is a series of interviews with some of the most experienced staff at The Research Institute. The newest episode features Gary Glasenapp. Gary has been at TRI for more than 30 years, working mostly on projects that enhance the educational experiences for professionals, children, and families in early childhood education. Here, he talks about his years as a "trainer of trainers" throughout the state of Oregon. Happy Holidays from all of us at TRI! we wish you the best that life has to offer!